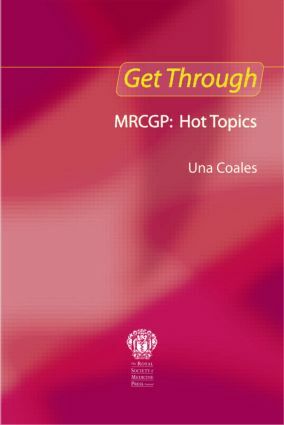 Get Through: MRCGP Hot Topics presents current clinical information and guidelines (e.g. NICE, SIGN, BTS, Royal Colleges, etc.) for the management of chronic diseases, including the guidelines for COPD (BTS/NICE) and hypertension (BHS). Also included is an A-Z of all topics that have been covered in recent examination modules, with the additional coverage of topics such as DVLA guideslines for fitness to drive, welfare benefits, child development and statistics. All topics are presented in easy to read outline format for ease of memorization. Sources for the material covered include the weekly British Medical Journal, weekly Doctor magazines, The Oxford Handbook Series, the BNF and websites of all current government and college guidelines. This book is therefore a culmination of several months spent reading and summarizing Hot Topics for you, the reader. The author of this book has clearly spent several months reading and summarising hot topics, which clearly makes the whole job easy for this year's candidates. There are two other books in this series and it is probably best read as part of a trilogy… There are particular topics that are welcomed in this book as they are so rarely covered so succinctly in other books; fitness to drive, mental health act and statistics to name but a few. I think this book will be an asset to anyone preparing for the exam and also a good aide-memoire to keep near you in your surgery.